It can be tricky to get enough kale into your diet. But the great thing about these baked kale chips is that they’re sooo good, and sooo easy to make that you’ll start wondering how much kale is TOO MUCH kale! I’ve been on a “New Year New Me!” campaign since January 1st that has comprised of cleaning my apartment from top to bottom, trying new things, taking more and longer baths and trying to introduce more leafy greens into my diet. The campaign is going pretty well so far. 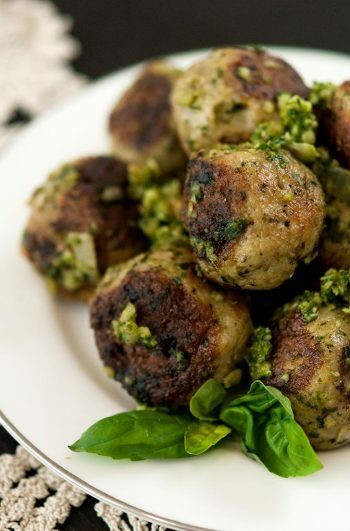 I’m serious when I say these are so delicious that you’ll wonder how much kale is too much. No joke. I had to google it to find out since these have become my go-to evening snack. 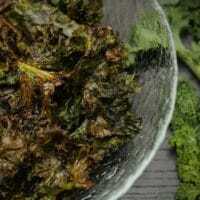 A bowl of kale chips is an entire bunch of kale, so I wanted to make sure I wasn’t ODing on thallium or something. 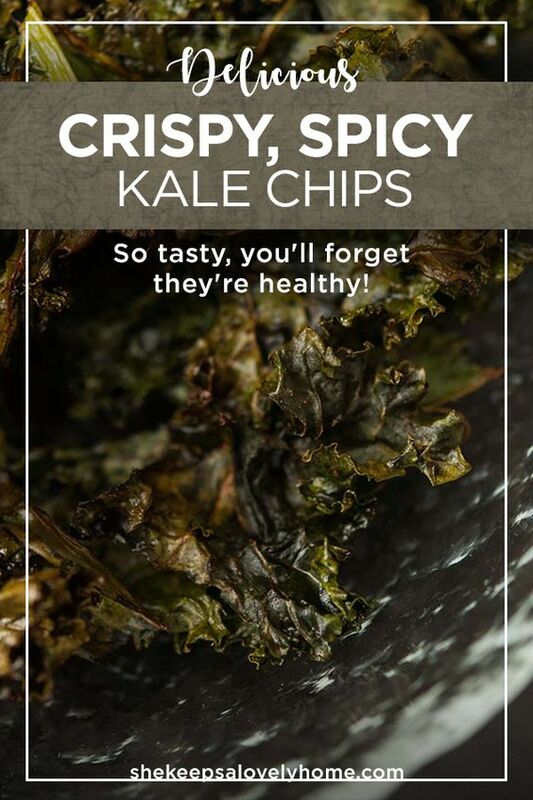 There’s a lot of conflicting info on how much Kale is too much, but from what I can gather, as long as you’re not eating more than 3-4 cups of kale chips a week, then you’re just fine. 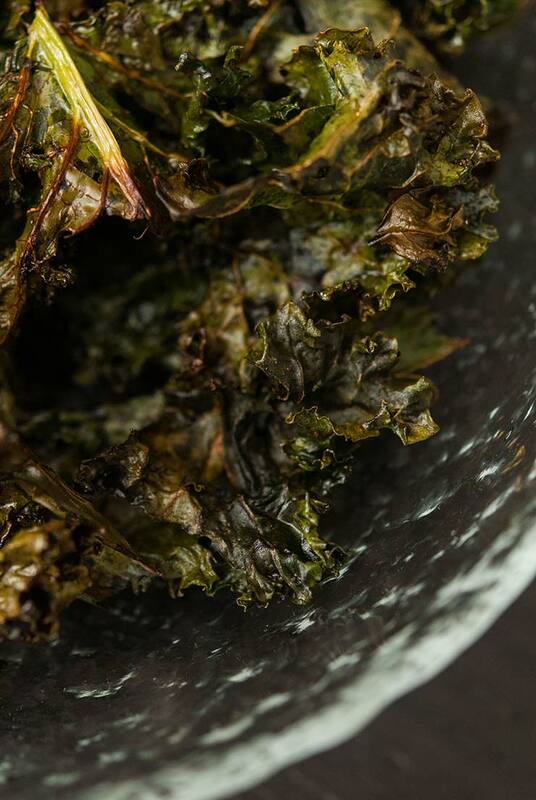 These kale chips are not only perfectly crispy and perfectly salty, they’re perfectly spicy! A little cayenne pepper turns these little veggie chips into such an exciting snack, so sprinkle your spicy spice to your comfort level. The amount I have in the recipe is a medium-spicy. First, preheat the oven to 275. 1. Rip the kale leaves off the stems, wash, drizzle with olive oil and Liquid Aminos. 2. Season with cayenne and fresh pepper. Use your hands to massage the oil and seasonings into the leaves gently, so that they’re perfectly coated. 3. Line a baking tray with tin foil, and spread the leaves out, evenly. Bake for 20-30 minutes. Some leaves become crispy faster than others, so simply remove the ones that are finished and leave the others to bake longer if they need more time. 4. Eat them straight away! You can save them in a container, but the crispiness wears out of them after about a day. You can always simply pop them back into the oven for another 5 or so minutes to crisp them back up again. 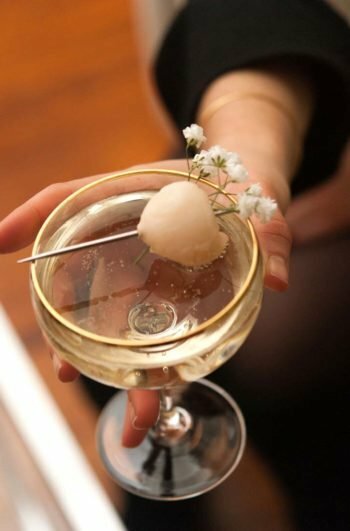 If you’re trying to eat more healthy, but want to keep your treats as yummy as possible, here are a few ideas! 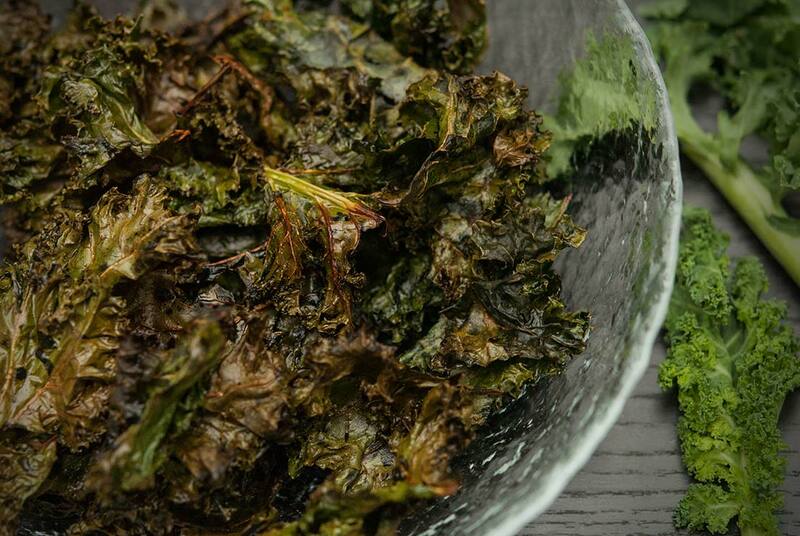 These kale chips are not only perfectly crispy and perfectly salty, they're perfectly spicy! Rip the kale leaves into "chip-sized" pieces off the stems and place the leaves in a bowl. 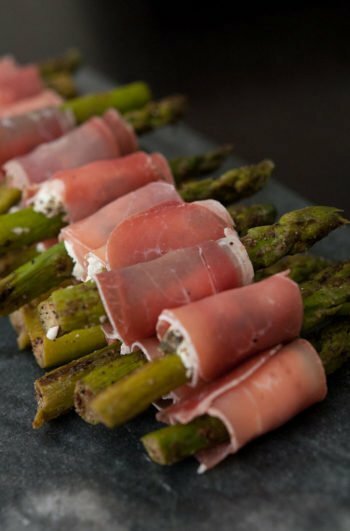 Drizzle with olive oil and Bragg's Liquid Aminos. Sprinkle with cayenne and fresh ground pepper. Use your hands to massage the oil and seasonings into the leaves gently, so that they're perfectly coated. Line a baking tray with tin foil, and spread the leaves out, evenly. Bake for 20-30 minutes. Some leaves become crispy faster than others, so simply remove the ones that are finished and leave the others to bake longer if they need more time. 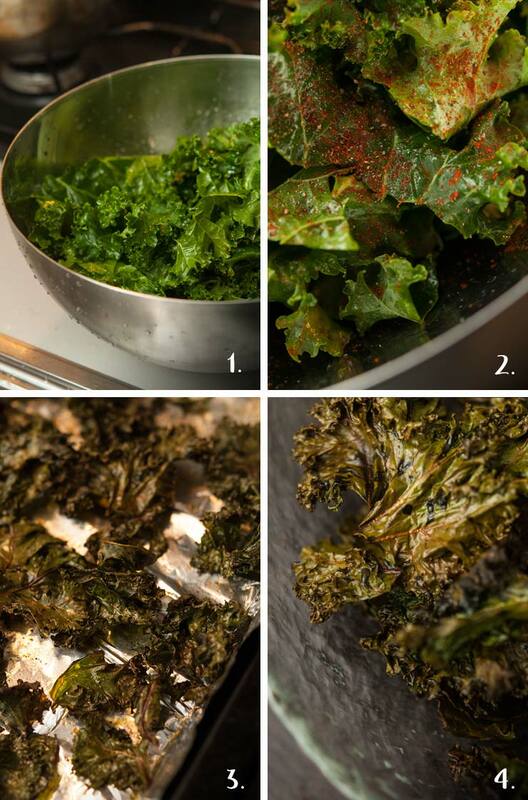 Depending on how wet your kale is after washing, or how high you've piled it onto your pan, this recipe can actually take anywhere between 15 minutes to an hour to get everything nice and crispy. If you've piled it a few layers deep and if it's a little wet, simply check on it every 15 minutes and take the crispy chips off the top while the others continue to crisp, layer by layer.